Overall, it’s a good time to be a startup. At least, that’s according to 94% of the nearly 900 venture-backed startup founders surveyed by First Round Review for their annual State of Startups report. With the goal of providing insight into the startup landscape, the report reveals what entrepreneurs are thinking and doing—how they think the industry will change and the biggest challenges they are facing. It also reveals founders perspective on the root causes and possible solutions for two significant and ongoing conversations in today’s workforce: diversity and inclusion and sexual harassment. Whether you recruit for, work at a startup, or are thinking of starting your own company, the report can help you benchmark against the industry and understand where there is room for improvement. Here are the 10 most important insights you should know. When it comes to the leadership issues that concern startup founders most, hiring good people came out on top. 74% said this was a concern for them—compared to 72% worried about revenue growth and 69% concerned about acquiring new customers. But despite this concern, most leaders don’t dedicate much time to hiring. In fact, three out of four respondents admitted to spending less than 20% of their time on it. The majority of founders (53%) are also concerned about their company culture, and nearly a third (29%) consider work-life balance an issue. Since both these factors can have a huge impact on hiring good people, it’s no surprise that so many founders are thinking about them. 25.8% of founders said that the hardest executive hire they made in 2017 was for a sales leader. 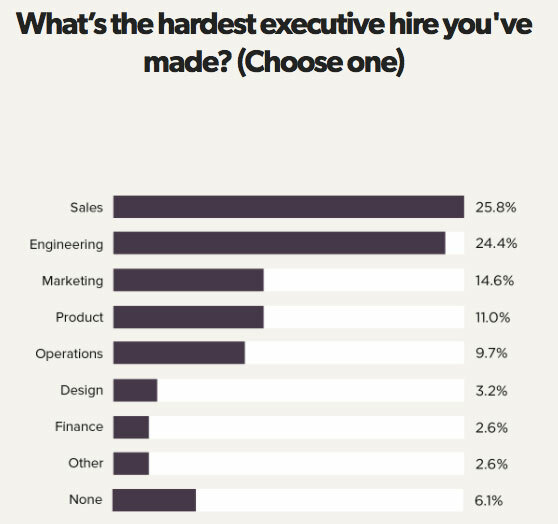 Engineering executive, which was the hardest roles to fill in both 2015 and 2016, came a close second, with 24.4% of respondents saying it was the hardest role to hire for in 2017. The report speculates that this change could be the result of more and more enterprises competing for top sales talent—and realizing that a bad sales exec hire can be incredibly costly. 56% of the founders surveyed said they had an easier time hiring in 2017 than the previous year. However, 44% said it was harder, so take that with a grain of salt. One possible reason for easier hiring could be the increasingly accessible and useful pool of data at recruiters’ fingertips, lending to smarter hiring decisions. Companies are also putting more effort into employer branding and more effective interview processes. 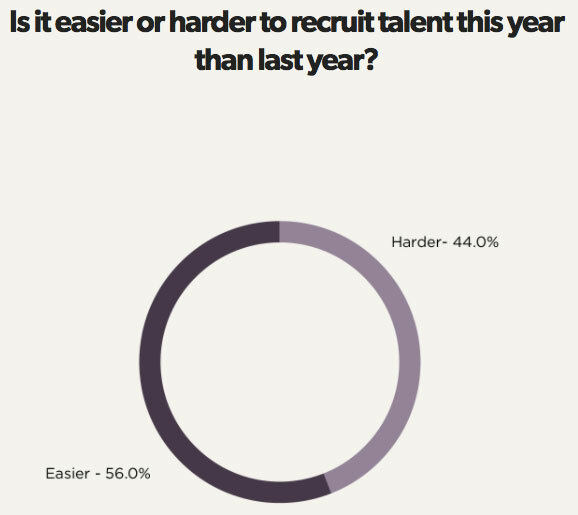 Whether it was easier or harder to recruit talent, 56% of founders said they are on track with their hiring plan, with another 3.5% ahead of schedule. But, 34.5% are falling behind. Timing is everything—and for 72.8% of startup founders, poorly timed hiring and firing has been the biggest mistake they’ve made in growing their business. More than half (51.5%) of respondents said they were guilty of waiting too long to fire someone. With a smaller team, the cost of a bad hire or toxic employee can be even more devastating. 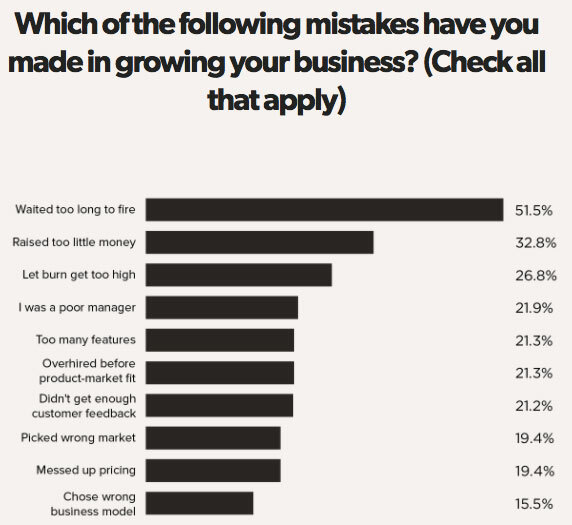 21.3% of founders made the opposite mistake: hiring too quickly. They admit that overhiring before reaching product-market fit was a big problem. Diversity remains a big challenge in tech. But more founders are say they’re unconcerned by the issue (42%) than say they are concerned (31%), with the remaining 26% feeling neutral. Despite this, women are underrepresented in the majority of startups surveyed. More than half (51.3%) of founders said their team as a whole is mostly made up of men, and 7.1% have all-male teams. Comparatively, 9.1% of teams are mostly female, and 0.8% of founders have all-female teams. Nearly a third (31.7%) of founders say the male to female ratio of their team is about 50:50. But this number hasn’t changed much in the past few years, with 31% reporting this in 2016, and 26% in 2015. Progress is being made, but slowly. 17% of founders said they already have a formal plan or policies in place to promote diversity and inclusion, a slight improvement over last year, when 14% said the same. A further 8.9% said they plan to adopt a strategy soon (formal or otherwise). 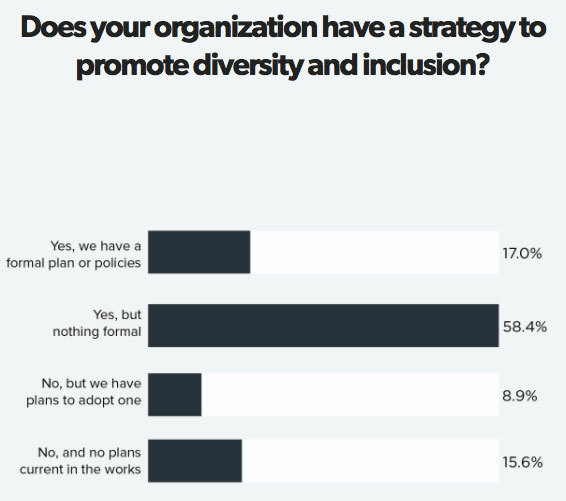 But but many (58.4%) have yet to put together anything formal together and 15.6% of respondents don’t have a strategy to promote diversity and inclusion at all—and currently have no plans to develop one. However, this is likely to shift. According to LinkedIn’s Global Recruiting Trends 2018, 78% of 900 surveyed recruiters and hiring managers globally say that diversity is the top trend impacting how they hire in 2018, as it becomes more and more clear that diversity is directly tied to company culture and financial performance. 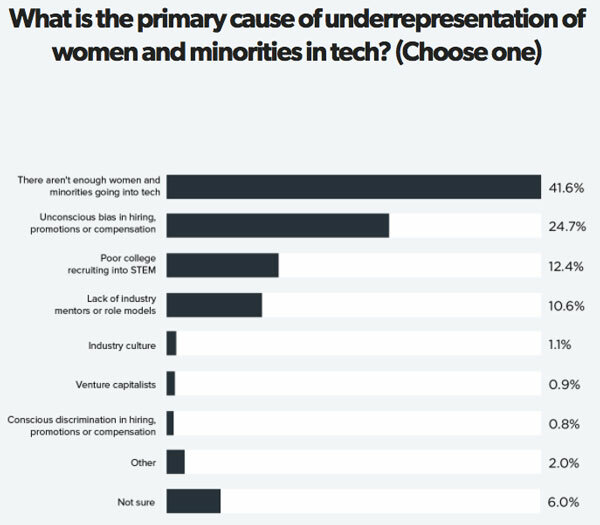 When asked what they think is the main cause of women and minorities remaining underrepresented in tech, 24.7% of founders blamed unconscious bias. But 41.6% said there aren’t enough people from these groups going into tech. Other culprits mentioned include poor college recruiting into STEM fields (12.4%) and a lack of mentors or role models in the industry (10.6%). Only 1.1% of respondents thought that the biggest problem is the culture of the industry as a whole. Another potential area of bias the report identifies relates to a candidate’s political leanings. One in four (25.8%) of founders said that knowing a person’s political beliefs would influence what they thought about hiring them. Politics becomes even more of an issue at more senior levels. 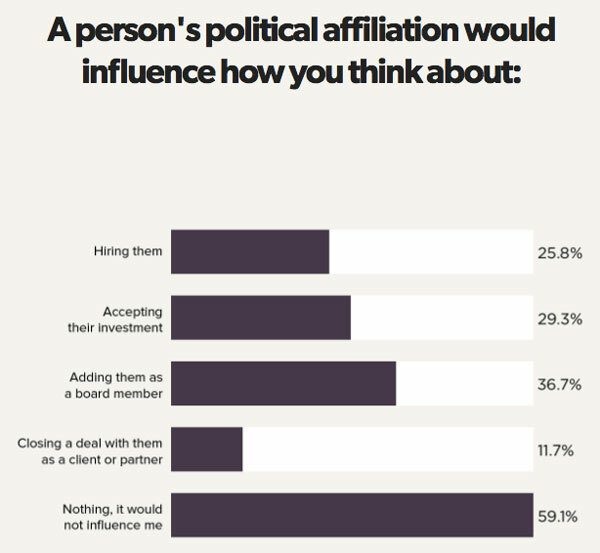 36.7% of respondents said it would influence their decision to add someone as a board member. But more than half (59.1%) of founders reported that a person’s political beliefs would have no influence over them whatsoever. As recent news coverage has made clear, sexual harassment is still a big issue affecting people across every industry. And 81.1% of founders recognize that the scope of the problem in tech is as bad or worse than the media has reported it, with only 18.9% saying the issue is overblown. In fact, more than half (51.3%) of founders say that they or someone they know has personally experienced sexual harassment at work. It’s important to note here that only 17.3% of respondents identified as female, and it’s possible that the figure is steeper among female founders. While most respondents agree that sexual harassment is a widespread issue in the industry, there’s a lot of disagreement over the most effective way to address it. The most popular solution (22.1%) was wider-spread sensitivity training, while 19.3% made the case for more female investors. 17% said that continuing to raise awareness of the issue through increased media coverage was the best option. Out of all the solutions proposed, decency pledges were viewed as the least effective (3.8%). But 5.2% of founders felt that nothing more needs to be done. These stats give us a taste of what entrepreneurs think, feel, fear, and value going into 2018. According to founders, now is an ideal time to start a company, with hiring good people being the biggest concern. Sales leaders have replaced engineers as the most difficult group to recruit. 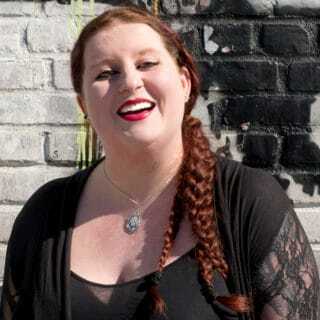 And across the industry, diversity and inclusion and sexual harassments remain challenges that will continue to be important topics this year and beyond. For more details on how startups are thinking about these issues as well as how they are increasingly embracing cryptocurrency as a new form of funding, how they work with investors, and more, read the entire State of Startups 2017 report.